The Costa Rican zebra tarantula—a must-have for hobbyists—originates from the wild shrublands of Costa Rica, Guatemala, and Nicaragua. This pet spider (also called the knee-striped tarantula) is strikingly beautiful with a black body, deep red hairs, white stripes on its legs, and orange spinnerets. These burrowing spiders live in large communities in the wild and use their burrows to insulate their bodies from harsh day temperatures and plummeting temperatures at night. As a pet, the zebra tarantula is quite easy to care for, as it can adapt to a wide range of living conditions. However, due to its skittish nature, beginner spider keepers may want to steer clear. Costa Rican zebras move very fast, making them a less likely candidate for those who like to handle their pet spiders. While docile in demeanor, this spider displays darting speeds when startled and is: 1. Hard to catch, and 2. Difficult to contain. Trying to capture and pick up this type of tarantula can lead to injury, should the spider fall into its cage or onto the floor from a substantial height. However, with daily socialization and gentle handling, the Costa Rican zebra tarantula can become moderately tamed to suit your lifestyle. Like most tarantulas, the zebra tarantula's barb-like hairs launch from its body when it feels it's in danger and can cause mild skin irritation. But—good news—this pet spider's venom is only mildly toxic to humans. A small 5- to 10-gallon aquarium is suitable for Costa Rican zebra tarantulas. The width of the tank should be two to three times wider than your spider's leg span and tall enough to accommodate a thick substrate for burrowing. The enclosure should also be escape proof. And, since spiders spend most of their time climbing, a wire mesh top is strongly discouraged. Specially designed spider terrariums sold at pet stores usually fit the suggested specs perfectly. The substrate on the cage's bottom should be at least 4 inches thick and made of peat moss, soil, or vermiculite. A hollowed out log, cork bark, half of a small clay flower pot, or a store-bought spider house can be used for a shelter. And various climbing supports like fake plants and vines should be situated throughout the enclosure. Like most tarantulas, this Central American carnivore prefers eating live prey with a strong affinity for crickets. This means, in addition to caring for your pet spider, you will also need to carefully care for its food source alongside it. Grasshoppers, beetles, and cockroaches can also be caught and fed to your pet, just make sure they have been dining on pesticide-free foliage. The occasional small lizard or pinky mouse can also be offered periodically for added protein. Feed your pet tarantula at least once a week, noting its growth and any increase in appetite. Be sure to remove uneaten food from the cage, as this can stress your spider and decaying remains can cause unhealthy conditions in its habitat. Provide an easily accessible water bowl as both a drinking and humidity source for your pet. Change the water daily and be sure to scoop up any substrate that becomes soaked with spills to prevent rot and bacteria growth. Tarantulas are a typically hardy breed of spider and seldom fall ill. However, falls are something to look out for. Even a short fall can be enough to rupture a tarantula's eggshell-like abdomen, resulting in death. For this reason, it is necessary to always sit (preferably on a carpeted floor) while handling your pet. Tarantulas can also succumb to dehydration, usually due to careless husbandry practice. 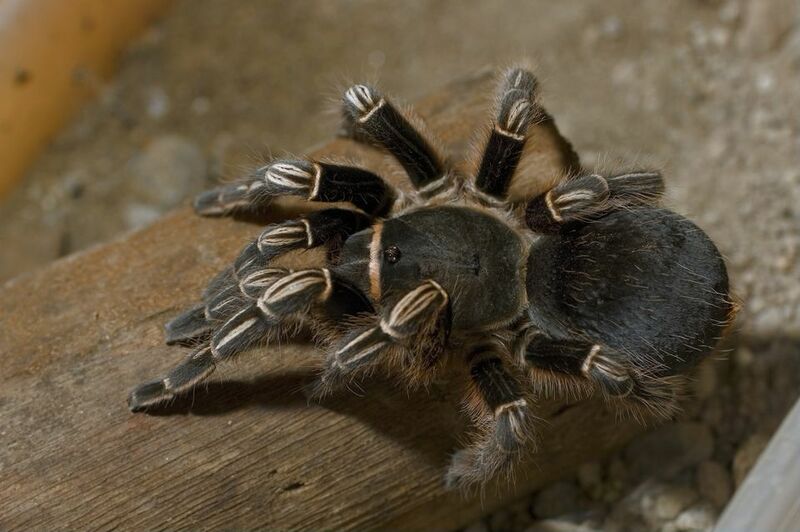 Since tarantulas get the bulk of their hydration from their food, make sure your pet's feeding schedule is regular. Changing the water daily and allowing it to evaporate will also help maintain hydration levels. But if you see your spider hovering over its water bowl and not drinking, you may need to mist the tank and monitor your pet closely. This is a sign that its environment is too dry. If your spider refuses to eat, acts listless, and is laying on it's back with its legs in the air, don't fret. This could be a sign of molting—an occurrence that happens annually when a spider sheds its exoskeleton. Leave your pet alone during a molt and monitor it closely. Once the molting period is over, remove the exoskeleton from the habitat and refrain from handling your spider or feeding it for several days. After three to five days, offer some food but still leave the tarantula in its enclosure until its new exoskeleton has time to harden. This is a very sensitive period for your spider. Before selecting your pet, make sure you've weighed the pros and cons of tarantula ownership. Remember, nearly all spiders are poisonous. And even if the venom is mild, someone in your household could have an allergic reaction if they are bitten. Also, most spiders do not like being picked up, making them a poor choice for pet owners who crave interaction. Zebra tarantulas can be purchased from a pet store or a breeder, with the latter being the preferred vendor. Breeders tend to exercise better husbandry practices than your typical pet store, assuring the health of the tarantula. Also, breeders handle pet spiders at an early age, making them less scared of humans and more likely to easily accommodate to a new environment. Maybe a Costa Rican zebra tarantula—with its darting speeds and multiple defense mechanisms—isn't the best choice for you. The docile and slow-moving rose-haired tarantula might be a better beginner option. And it's easy to source this species, too, both from breeders and pet stores. The curly-haired tarantula is another calm spider, yet it requires a higher humidity level than its rose-haired cousin, making it slightly higher maintenance. The Mexican red knee tarantula also makes a great beginner pet and can live up to 20 years in captive.